Pelvic floor exercises, videos and information helping you safely recover your fitness living with prolapse, after prolapse surgery, hysterectomy or postpartum. One of the biggest challenges facing women living with pelvic floor problems is knowing how to exercise safely. Unfortunately many women don't know how to exercise safely with prolapse problems, after hysterectomy or continence surgery. Some women cease exercising altogether and miss out on the tremendous physical and emotional benefits of exercise. Others continue with exercise programs that are unsafe for their pelvic floor, worsening problems such as prolapse or incontinence. 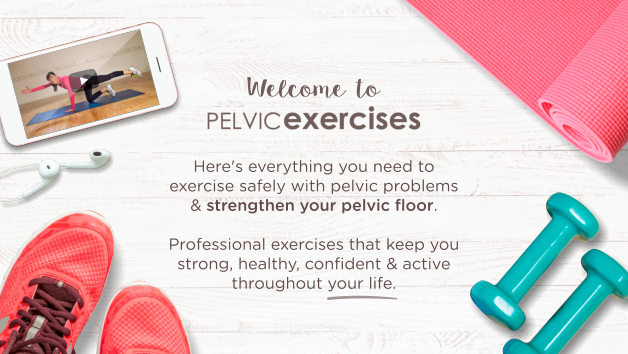 Pelvic exercises is a Physical Therapist site dedicated to helping women with pelvic floor problems exercise safely with accessible, trustworthy and reliable health professional information. Where to Start Your Exercises? Our information and exercise videos are freely available to help all women. If you're looking for information on specific exercises simply enter your search term e.g. 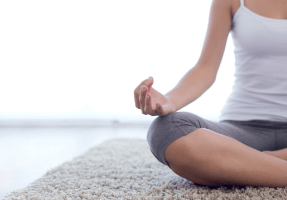 "Yoga exercises" into the search bar to the right of your screen. Alternatively you can find exercise information by clicking on the categories listed in the 2 menus to the right of your screen - Pelvic Exercises Library and Online Pelvic Exercise Videos. Finding a pelvic floor safe exercise provider near you. Please feel most welcome to freely browse our content or contact us for further information. Get Pelvic Exercises FREE Newsletter in your Inbox! Join thousands of women who receive our free monthly newsletter & get your COMPLIMENTARY pelvic floor exercise video now! P.S. After registering above, please check your inbox for a confirmation link to click and activate your subscription. Kegels.com.au is a discreet website to help you access specialised women's health and pelvic floor strengthening products. Just wanted to say a quick thank you for your wonderful website and all the fantastic educational videos. I am three weeks post op from my surgery and your site has answered many important questions for me and helped me on my way to recovery. Big thank you! Thank you, I really appreciate the extent to which you as a professional go to assist others. I just want to reach out and hug you. I looked online a year ago for anyone who taught exercises safe for prolapsed uterus and I came across your website. I am so happy that now I can finally exercise without further prolapse issues. Thank you! Thank you Michelle finding your newsletter very helpful also your exercise book for prolapse which I’ve recently received – excellent! Will certainly recommend to others. I am located in the heart land of America. I see you are in Australia. Women everywhere need this type of help and understanding. Thank you so much for all the information and help you provide on this personal matter. My surgery was done in one of the top hospitals in the country. I got no instructions and even when I emailed them I got no advice. I was so lucky to find you on line and get answers to my questions. Please continue your wonderful work which is so important and so neglected. Thanks for helping so many women with your focus on a neglected area of the body that has such a big impact on how well woman can live their lives. Your website has been of great help and encouragement to me… I don’t know where I would have got started otherwise. I am recovering from a total hysterectomy and I Just wanted to take a moment and thank you for providing these professional, tasteful and positive videos… I’ve watched several of them and they are all very well done. It is great to know that thanks to technology you are able to help people around the world.